Managed Print Services (MPS) present an extremely valuable solution for businesses who want to control their printing costs and improve workflow. 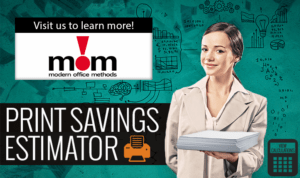 Offices across the globe and right here in Ohio are realizing enormous savings of both money and time as a result of outsourcing all of their printing needs to a single, trusted vendor, like Modern Office Methods. While no two companies are exactly alike, the process of implementing MPS is a strategic and clearly-defined proceeding. When making the decision to proceed with an MPS solutions, it is certainly beneficial to understand the steps involved and what to expect. 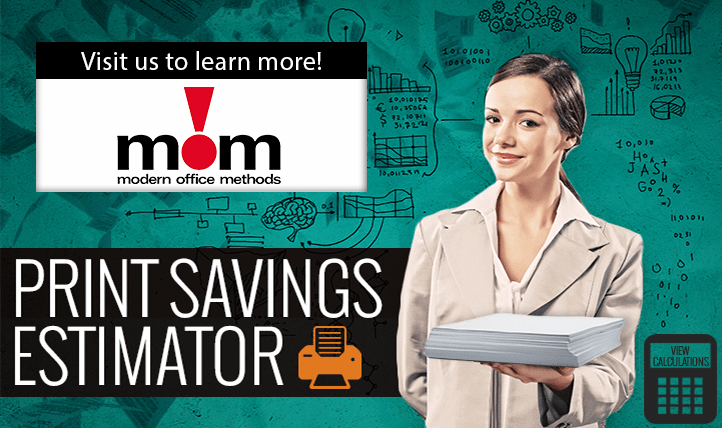 Utilizing our Print Savings Estimator is a quick way to estimate how MPS can impact your office. Simply enter the number of employees at your office and learn about the average savings over 1 and 5 years. Monetary savings is, of course, outlined as well as the savings on paper, trees, and waste. In the initial stage, organizations implement MPS in order to gain control of their hardcopy fleet. Companies entering into this stage are often surprised at the cultural resistance encountered from their staff, as well as the actual number and variety of devices that are being deployed within their agency. The main objectives of this stage include centralizing the decision-making operations within the fleet and assessing usage patterns. During the second stage, organizations move from gaining control of the fleet to optimizing it. Here, companies ensure that devices are being deployed and positioned in a cost effective way, while effectively supporting the needs of their end users. This requires an increasing level of service from service providers in order to track device usage, and to actively manage the fleet. In the final stage, organizations begin to look beyond cost reduction or containment, to actually improving their performance and business processes by implementing electronic document workflow, document management, document repositories, scanning solutions and other activities that actually enhance and improve basic business processes. At this level, MPS vendors bring an entirely new set of skills and abilities to the table. In fact, the vendor moves into a “consulting” role versus just providing hardware, supplies, and maintenance management services. This stage also requires that the vendor intimately understands the customer’s industry and business model. The idea of implementing an MPS for your organization may seem like a daunting challenge. However, it has evolved into a routine, well-established process that can also be customized to the individual needs of your business. MPS deployment is a long-term engagement and will likely impact almost every aspect of an organization—but for the better! A well-executed MPS solution will enable your business to experience both immediate and long-term cost savings. Hey this looks like a really useful post that could help many people out. Thanks for writing about it and posting it on your blog. Love it when people post productive stuff.